One of the most powerful tools for understanding the formation and evolution of galaxies has been the use of computer simulations--numerical models of astrophysical processes run on supercomputers and compared with astronomical observations. 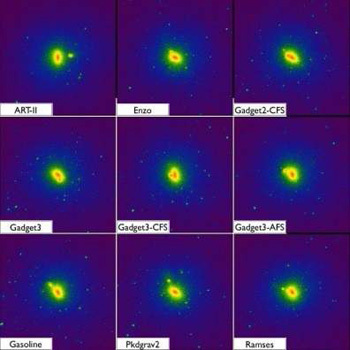 Getting computer simulations to produce realistic-looking galaxies has been a challenge, however, and different codes (simulation programs) produce inconsistent results. More information about AGORA is available in the paper, "The AGORA High-Resolution Galaxy Simulations Comparison Project," preprint available at arxiv.org/abs/1308.2669. The official AGORA website is at www.agorasimulations.org.